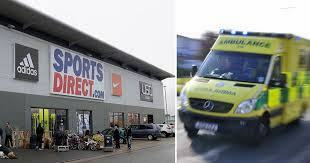 John's Labour blog: Why did Sports Direct call ambulances 82 times? Sports Direct’s Shirebrook warehouse is the heart of the giant sportswear retailer, handling clothes and kit that will be sold all over the country. The pace of work there is relentless, and the harsh conditions have long been protested by Unite, who represent workers there. But now a new BBC investigation has confirmed just how damaging Shirebrook is to its workers’ health. The BBC’s Inside Out team used freedom of information requests to find out that over the last two years, ambulances have been called out a frightening 82 times, with 36 occasions described as ‘life-threatening’. The emergency cases uncovered by the BBC included incidents of chest pains, breathing problems, convulsions and strokes. Shirebrook operates a ‘six strikes and you’re out’ policy, with even minor infractions of the strict work codes – like chatting to colleagues or taking an excessively long toilet break – punishable with a warning. It’s no wonder many feel scared to take time off sick, even when they really need to, and people are pushed to the limits of their health. This can’t be allowed to go on. Every time we tell someone about Shirebrook we shine another spotlight on what’s happening there, and help the Unite members who are fighting for respect and decent work. Update: controversy owner of Sports Direct, Billionaire Mike Ashley has now been charged with a criminal offence following collapse of one of his companies.